My grandfather would have said, "You seen one town, you seen 'em all." And that's true if you're looking at this bunch of towns' signs, for they all say Montreal. 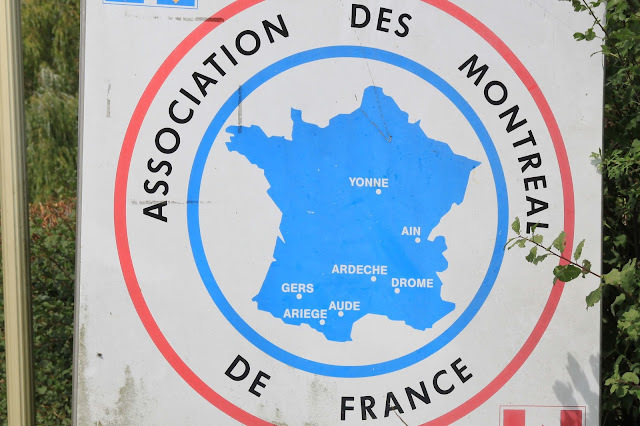 This tiny little village in Burgundy is one of seven Montreals in France, part of the Association of Montreals of France. Not only is it not the only Montreal, it's not the only town association, either. There's also the Most Beautiful Villages of France, Little Towns of Character, and let's not forget Towns with Raunchy Names. Montreal in the department of Yonne (Burgundy area) is a charming place that dates back to medieval times, much of it built in the 11th through 13th centuries. It's hard to say which is the oldest of all the Montreals, but it's easy to say which one is not the oldest, and that's the biggest and most famous one you're thinking of in Canada. Like Montreal in Canada, it's got a heavily Catholic history. The Notre Dame in this Montreal is considered one of the town medieval architectural gems, called out by the famous French Reniassance architect Violett-le-Duc. This particular Montreal is closely linked with 16th century French King Francois I, which explains this salamander -- his royal symbol. There is an organization for Petites Cités de Caractère -- Small Towns with Character -- such as Apremont in the Vendée. They're not kidding, by the way; just like the villages on the Most Beautiful Villages of France list (not one of which has ever disappointed me in the slightest), these little towns are carefully selected and are, indisputably, charming. Cabourg, a small town on the Normandy coast, is very proud to be part of an association, or two, or five. There's the Flowered Villages, FamilyPlus (Destinations for Children and Adults), Internet City 2015, Lions International, and Golden Flower 2013. 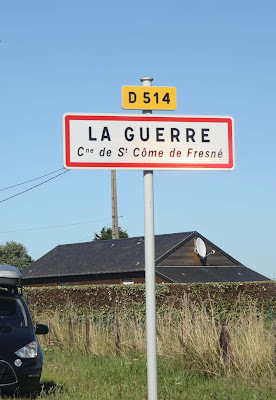 This one is not raunchy, and not part of any association that I can tell, but I find it a pretty interesting name, especially for a town in Normandy. 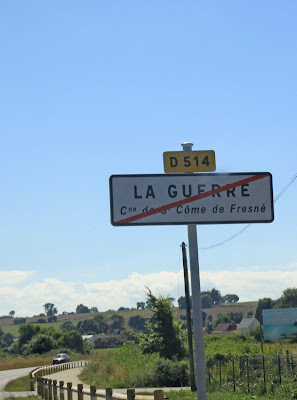 Since "Guerre" means "War", first you are in War and then, since it's a tiny town, after just a very brief interval, you are out of War. All Wars should be this way. In this same spirit in Paris, you can look up at the street signs. Here are my favorite pair of street names: the Rue des Mauvais Garcons (Street of the Bad Boys), and the Rue des Bons Enfants (Street of the Good Children). Not surprisingly, they never intersect. Le Saint Mont des Alpes is a hard mountain cheese made from raw milk from Tarine or Abondance cows in the department of Savoie. It was originally made by a smaller coop but in 2013 was purchased by Monts et Terroirs, larger coop created in 1954 and now part of an even larger French dairy coop that owns the brands of Yoplait and Candia. They also own the brand Entremont, and you will sometimes find Le Saint Mont des Alpes under both brand names: Entremont and Monts & Terroirs. It's a smooth hard cheese that is almost crumbly, but not quite. It's a mild mountain cheese, with sweet hints of nuts and grass. Le Saint Mont des Alpes has won several medals, over many years at various contests, and most recently a gold in 2016. But it's not the kind of cheese that hits you over the head with flavor and character. It's a mild, and mildly sweet, cheese and can often be found in grocery stores. The cheese is not a royal mountain -- a mont real -- but at least it's a sacred, sainted mountain -- a saint mont. The one I buy is made by Monts & Terroirs (Mountains & Territories), but it's also made by EntreMont (BetweenMountains). The nearest Montreal of France is not far away, in the department of Ain.